José Kurtz is an atheist, or at least he plays one to annoy the religious leaders of Mexico City’s tightly knit Jewish community. That puts him in an awkward spot when charged with organizing the funeral services for his former wife Norah. 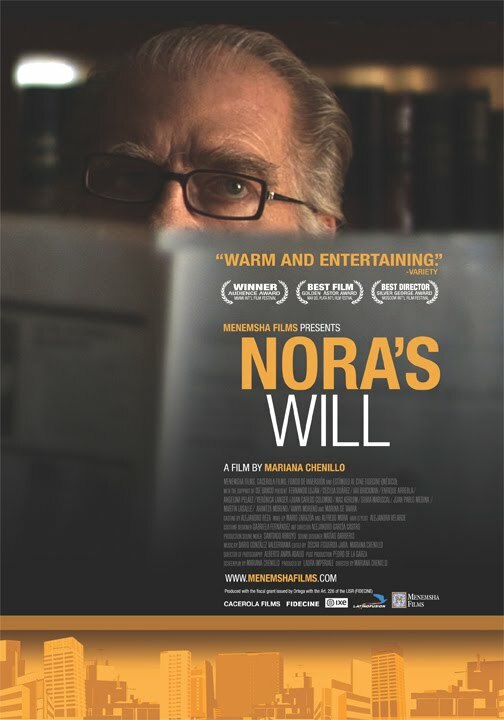 Yet, it quickly becomes clear nobody knew her better than her curmudgeonly ex in Mariana Chenillo’s elegant elegy Norah’s Will (trailer here), which opens this Friday in New York. When Kurtz walked out on the mother of his grown son, he did not get far—just across the street, in fact. Still in contact, he thinks nothing of receiving a large shipment of frozen meat for her, presumably for the upcoming Passover dinner. Indeed, her final exit appears to be part of a grand manipulative act to gather the family together. Unfortunately, her suicide and Kurtz’s prickly attitude make it difficult for him to fulfill the terms of her will—particularly the religious burial service. Though we occasionally see a younger Norah in flashbacks, it is remarkable how well Chenillo establishes the dynamics of their complicated relationship through José’s eyes. In the process, we come to understand he was actually a far better father and husband than his son will ever know. One of the great grumpy old men of the movies, Fernando Luján’s José Kurtz is devilishly funny and painfully real. It is one of the most gracefully nuanced turns audiences will see on-screen for quite a while. Unfortunately, the acorn seems to have fallen fairly far from the tree with his rather milquetoast son Rubén, never really brought to life by Ari Brickman. In truth, most of the extended family is colorful in a rather bland indie movie kind of way. Yet, it is Luján’s film and he makes the most of it in several deeply moving scenes. Wisely, it also holds onto a few of its secrets, in effect respecting the privacy of its lead characters. A classy package, Chenillo and cinematographer Alberto Anaya Adalid bathe Will in warm glowing light, giving the proceedings an art-house sheen, while Darío González’s score is appropriately sensitive (if not especially memorable). It all serves an apparently simple but surprisingly de ep family drama. It is even ultimately forgiving of organized religion, finding wiser representatives than the fuss-budgets Kurtz delights in antagonizing. Mexico City’s Jewish community has proved quite cinematic, appearing in Alejandro Springall’s relatively recent My Mexican Shivah as well. (Hopefully, the next such film will involve a wedding rather than a funeral.) It proves to be a milieu worth revisiting though. At heart, Will is a deeply humanistic love story, featuring a near perfect screen performance from Luján. Wiser and gentler than most of the decidedly gritty recent Mexican cinematic imports, Will is definitely recommended. It opens this Friday (10/15) uptown at the Paris Theatre, New York’s single screen movie palace.